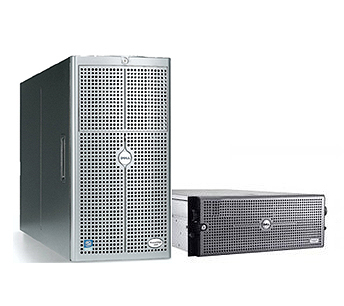 The Dell PowerEdge 2800 is a 64-bit server that comes in either a tower or rackmount configuration. A variation of the popular 2850 rackmount model, the PowerEdge 2800 has a roomier chassis and is an excellent choice for businesses looking for flexibility, high-availability, expandability and performance, all on a limited budget. The PowerEdge 2800 features dual Intel Xeon single or dual-core processors, an 800MHz front side bus, up to ten (10) hot-pluggable U320 SCSI hard drive bays, redundant power supplies and a maximum of 16GB DDR-2 memory. Expandability includes I/O slots for several PCI-X and PCI-e riser slots depending upon selected options. The PowerEdge 2800 offers the performance along with room to grow. The award-winning PowerEdge 2800 has built a solid reputation on reliability and versatility, in addition to durability as they are still in use in many data centers for a wide range of applications like email and print operations, load-balancing and web hosting. Certain configurations can even be used for virtualization. Choose a system below to configure or select a category of replacement parts.